Please welcome today’s guest poster, Jessi. There is something to be said about growing, picking, cooking and eating something from your own garden. Unfortunately, not everyone is capable of having a full garden in their back yard. A lack of a back yard does not mean you cannot have a garden; a lack of a back yard means your garden is on a much smaller scale. Small gardens are also a great way to get kids involved in the cycle of growing plants, learning responsibility and healthy eating. Commercially, there are several containers for growing your own herbs that are designed for growing in a small, controlled environment. These containers will fit on an average windowsill and herbs growing in these containers need very little care outside of water and sunlight. Herbs also grow continually so you can have fresh herbs all year long; however, be sure to take caution with them in winter especially if you live in an area where snow is prevalent. Gardeners interested in growing something larger than herbs should think smarter, not bigger. Various vegetables such as squash, tomatoes, and cucumbers can grow in relatively small areas. 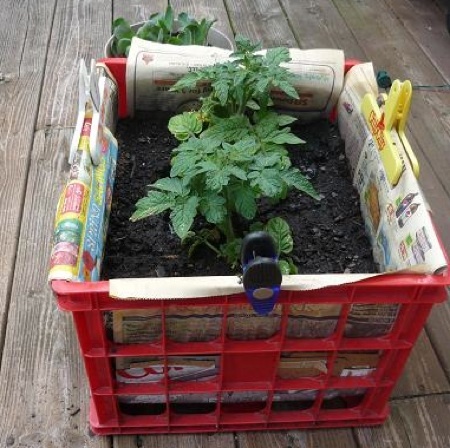 While you may need large buckets for adequate space, you can still manage to grow vegetables easily. Small vegetables such as carrots and peppers can grow in cut and well-cleaned bleach jugs. The procedure is the same for preparation and growing in a five-gallon bucket or a one-gallon bleach jug. Begin by prepping your buckets or jugs — wash them out thoroughly with soapy water and rinse completely. Drill drain holes in the bottom because vegetables need well-drained soil for growth. Fill with potting soil from a home improvement store, and plant seeds according to the directions. Water well and place in direct sunlight. Place your buckets and jugs on bricks or wooden blocks for drainage. Vegetables, particularly the summer varieties, need lots of direct sunlight. Six to eight hours of direct sunlight is necessary, but be certain to water adequately each day or if the top of the soil feels dry to the touch. Water your seeds or plants until water runs out of the bottom of the buckets. Your vegetables will need fertilizer, but use sparingly. If you use a fertilizer that you mix in water, use one half of the recommended amount every few days. Dry fertilizers can be used, but are not as effective as water-soluble fertilizer. Sprinkle limited quantities of dry fertilizer on the top of each bucket or jug once every three to four weeks. Once your vegetables are ready to pick, reuse your buckets for late summer or fall vegetables and fruits. The vines and detritus will make excellent compost. Fill a bucket about one third from the bottom with soil; add the vines and detritus; fill with more soil and water. Let this sit for a few weeks, being sure to keep moist. After a few weeks, transfer the contents to another bucket. Transferring the compost aerates the soil and mixes the compost thoroughly. Add more water after mixing to keep soil moist. When you are ready for the next round of vegetable seeds, you will have a well-prepared soil to grow your next season’s crop! Jessi is an aspiring gardener and do-it-yourselfer who is dedicated to making her small home a warm, green and happy place to be. When she’s not busy working in her garden or dreaming up her next project she works as a Community Coordinator for PartSelect, where she’s dedicated to helping other DIYers tackle home repairs. Or just use a bag of potting soil. Lay it flat, poke holes on the bottom side for drainage, create openings on the top side for plants (adding a collar for the holes helps when watering), add plants and keep watered. I grew some tomatoes this way last year and it worked great.